American pilot astronaut 1963-1969. Member of first crew to orbit the moon. Status: Inactive; Active 1963-1969. Born: 1933-10-17. Spaceflights: 1 . Total time in space: 6.13 days. Birth Place: Hong Kong. PERSONAL DATA: Born October 17, 1933, in Hong Kong. Married to the former Valerie E. Hoard of Lemon Grove, California. Four sons, two daughters. Recreational interests include fishing, flying, and cross-country skiing. He also serves on several corporate boards. EDUCATION: Received a bachelor of science degree from the United States Naval Academy in 1955 and a master of science degree in Nuclear Engineering from the Air Force Institute of Technology at Wright-Patterson Air Force Base, Ohio, in 1962. Completed the Harvard Business School Advanced Management Program in 1979. ORGANIZATIONS: Member of the Tau Beta Pi National Engineering Honor Society, American Nuclear Society, American Institute of Aeronautics and Astronautics, Society of Experimental Test Pilots, and the National Academy of Engineering. AWARDS AND DECORATIONS: Distinguished Service Medals from the Air Force, NASA and the Nuclear Regulatory Commission; Air Force Commendation Medal; National Geographic Society's Hubbard Medal for Exploration; Collier, Harmon, Goddard and White Trophies; and the American Astronautical Society's Flight Achievement Award. He has been awarded several honorary doctoral degrees. He holds several world flight records, and received the American Defense Preparedness Association's first Industry Leadership Award in May 1993. 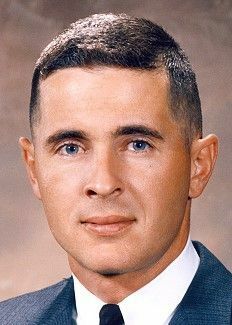 EXPERIENCE: Anders was commissioned in the air Force after graduation from the Naval Academy and served as a fighter pilot in all-weather interception squadrons of the Air Defense Command and later was responsible for technical management of nuclear power reactor shielding and radiation effects programs while at the Air Force Weapons Laboratory in New Mexico. In 1964, Anders was selected by the National Aeronautics and Space Administration as an astronaut with responsibilities for dosimetry, radiation effects and environmental controls. He was backup pilot for the Gemini XI, Apollo 11 flights, and was lunar module pilot for Apollo 8 -- the first lunar orbit mission in December 1968. He has logged more than 6,000 hours flying time. From June 1969 to 1973 he served as Executive Secretary for the National Aeronautics and Space Council, which was responsible to the President, Vice President and Cabinet-level members of the Council for developing policy options concerning research, development, operations and planning of aeronautical and space systems. On August 6, 1973, Anders was appointed to the five-member Atomic Energy Commission where he was lead commissioner for all nuclear and non-nuclear power R&D. He was also named as U. S. Chairman of the joint US/USSR technology exchange program for nuclear fission and fusion power. Following the reorganization of national nuclear regulatory and developmental activities on January 19, 1975, Anders was named by President Ford to become the first Chairman of the newly established Nuclear Regulatory Commission responsible for nuclear safety and environmental compatibility. At the completion of his term as NRC Chairman, Anders was appointed United States Ambassador to Norway and held that position until 1977. Anders left the federal government after 26 years of service and after briefly serving as a Fellow of the American Enterprise Institute he joined the General Electric Company in September 1977 as Vice President and General Manager of the Nuclear Products Division in San Jose, California. In this position he was responsible for the manufacture of nuclear fuel, reactor internal equipment, and control and instrumentation for GE boiling water reactors at facilities located in San Jose and Wilmington, North Carolina. In addition, he had responsibility for the GE partnership arrangement with Chicago Bridge and Iron for the manufacture of large steel pressure vessels in Memphis, Tennessee. In August 1979, Anders was placed on special assignment to attend the Harvard Business School's Advanced Management Program. On January 1, 1980, Anders was appointed General Manager of the General Electric Aircraft Equipment Division with headquarters in Utica, New York. With more than 8500 employees in five plant locations in the Northeastern U.S., the Aircraft Equipment Division products include aircraft flight and weapon control systems, cockpit instruments, aircraft electrical generating systems, airborne radars and data processing systems, electronic countermeasures, space command systems, and aircraft/surface multi-barrel armament systems. In 1984, he left GE to join Textron as Executive Vice President-Aerospace, moving to Senior Executive Vice President-Operations in 1986. He was also a consultant to the Office of Science and Technology Policy and was a member of the Defense Science Board & the NASA Advisory Council, and is a retired Major General in the USAF Reserve. Mr. Anders was made Vice Chairman of the General Dynamic Corporation for 1990 and was made Chairman & Chief Executive Office January 1, 1991. In 1993 he retired as an employee of the corporation but remained Chairman of the Board until May of 1994 when he fully retired from company service. BIRTHPLACE AND DATE: Anders was born October 17, 1933, in Hong Kong. EXPERIENCE: After graduation Anders was commissioned in the U.S. Air Force and served as a fighter pilot in all-weather interception squadrons of the Air Defence Command. After receiving his Master of Science degree he was assigned responsibility for technical management of nuclear power reactor shielding and radiation effects programs at the Air Force Weapons Laboratory. NASA selected Anders as an astronaut in 1964. After Mike Collins had to leave the crew due to an illness, Anders received his first flight assignment on the Apollo 8 crew, together with Commander Frank Borman and Jim Lovell. A last minute decision was made to send Apollo 8, only the second manned Apollo flight, into lunar orbit in order to beat the Russians. On December 21, 1968, the Apollo 8 crew became the first humans to reach escape velocity as their Saturn V put them on a trans-lunar trajectory. Early on Christmas Eve, the Apollo 8 command-service module braked into lunar orbit. In an unforgettable Christmas message to the world, Borman, Lovell and Anders read the story of creation from the first ten verses of the Bible's Book of Genesis, while sending a vivid televised image of the stark lunar surface rolling by below. On Christmas Day, Apollo 8's engines pushed the crew out of lunar orbit and back toward Earth to a landing in the Pacific Ocean. Anders left NASA after the Apollo 11 mission and served as executive secretary of the National Aeronautics and Space Council from 1969 to 1973. In 1973 he was appointed to the Atomic Energy Commission. Following reorganisation of national nuclear regulatory and development activities in 1975, Anders was named by President Ford to become the first Chairman of the new Nuclear Regulatory Commission. Ford later named him U.S. ambassador to Norway. Anders left the federal government after 26 years of service in 1977 and assumed a series of management positions with the General Electric Company. Later he worked as Senior Executive Vice President-Operations, Textron, Inc. Anders retired as Chief Executive Officer of General Dynamics in 1993, but remained Chairman of the Board. He finally retired from General Dynamics in 1996. Anders then became President and Director of The Anders Foundation, a philanthropic organisation. He held the rank of major general in the Air Force Reserve. Family: Astronaut. Country: China, USA. Spacecraft: Gemini. Flights: Gemini 11, Apollo 503, Apollo 8, Apollo 11. Projects: Apollo. Agency: USAF. Bibliography: 5105. 1933 October 17 - . Birth of William Alison 'Bill' Anders - . Nation: China, USA. Related Persons: Anders. American pilot astronaut 1963-1969. Member of first crew to orbit the moon. 1 spaceflight, 6.1 days in space. Flew to orbit on Apollo 8 (1968)..
1965 May 17 - . MSC to participate in Apollo LEM manned environmental control system tests - . Nation: USA. Related Persons: Anders. Program: Apollo. Spacecraft: Apollo LM, LM Communications, LM ECS. MSC informed Grumman it believed it would be beneficial to the LEM development program for MSC to participate in the manned environmental control system tests to be conducted in Grumman's Internal Environment Simulator. The following individuals were suggested to participate: Astronaut William A. Anders or an alternate to act as a test crewman for one or more manned runs; D. Owen Goons or an alternate to act as a medical monitor for the aforementioned astronaut; and John W. O'Neill or an alternate to monitor voice communications during the test and record astronaut comments.